Even with an internal tussle for playlist power, the Icelandic women’s national team are pulsing toward this summer’s European Championship in fine voice, and with the excitement of a new club to go with the prospect of another major tournament, experienced left-back and resident team DJ Hallbera Guðný Gísladóttir is happily locked into the rhythm. When the Dutch-hosted Euro 2017 arrives this July, many of women’s football’s best will come together for three weeks of top international play in a tournament that will also undoubtedly serve as a celebration of the game’s good. It will be the first time the competition has had as many as 16 teams and there will be debutants in the shape of Austria, Belgium, Portugal, Scotland and Switzerland. Iceland will also take their place, but not for the first time, as they bid to build on appearances at Euro 2009 and 2013, with an impressive quarter-final showing in Sweden catching the eye last time. Freyr Alexandersson’s team topped their qualifying group and are by now no longer sitting under the radar, although they could still carry a certain ‘surprise package’ quality. Midfield duo Dagný Brynjarsdóttir (Portland Thorns) and Sara Björk Gunnarsdóttir (VfL Wolfsburg) may be notable exceptions, but the majority of the squad currently play their club football back home or in Sweden. The left-sided Hallbera Guðný Gísladóttir, 30, is one such example, having recently joined Djurgårdens IF after time back in Iceland and an earlier stint with Italian side Torres. Nine years since she debuted for her country, Hallbera has 76 caps and is one of the most familiar personalities in the group. She explains the role a soundtrack has in bringing it all to life when the team is together, with a dancing defender and vocally shot-sure forward the ones most worthy of a mention. Returning to Sweden with Djurgårdens having represented Piteå IF in 2012 and 2013, Hallbera has got used to that unmatchable trophy-winning feeling during her club career in Iceland. 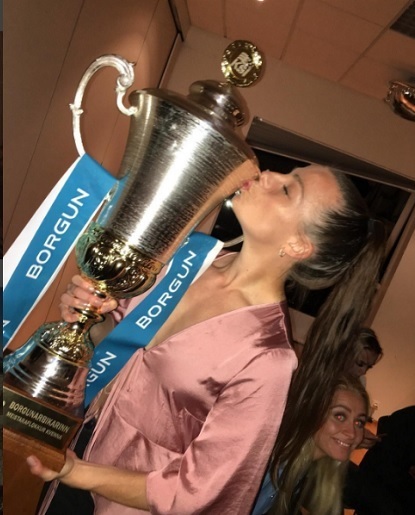 With Valur, she lifted the top-tier Úrvalsdeild kvenna five times and won the domestic cup on four occasions, while she added another league and cup more recently with Breiðablik, Icelandic women’s football’s most successful club. On the international front, she has gained not just the knack of on-field understanding in her career, but also a pretty good handle on what hits the spot for the national team at certain preparatory or celebratory moments behind the scenes. “I have taken the role as a DJ in the locker room and go by the name ‘DJ Razzberry’. In my own opinion, there’s no one better! Included in the latest squad for the Algarve Cup, Hallbera came up with one of her three international goals in the final of the tournament back in 2011, and against the United States, no less. Her goal had put Iceland 2-1 ahead after Margrét Lára Viðarsdóttir cancelled out Carli Lloyd’s opener, and despite the U.S. coming out 4-2 winners, that year’s edition of the notable friendly competition had been very positive for Iceland as they beat China, Sweden and Denmark in the group. ‘DJ Razzberry’ doesn’t just come up with the odd goal against the Americans, she also likes to borrow some of their late-80s glam metal to help find that fire to pull her through a cardio session. “I always listen to music before a game, both at home and in the locker room. Also, I like to put my headphones on when I’m taking walks and just put some random songs on. Although they were beaten 2-1 by Scotland in Reykjavík in the final game, Iceland had a near-flawless European Championship qualifying campaign. Of their eight games, they won seven, and their tally of 34 goals was bettered only by Germany and Spain. Harpa Þorsteinsdóttir’s ten goals tied her for top scorer with Norway’s Ada Hegerberg and Scotland’s Jane Ross, but even with her defensive station, Hallbera had a couple of goals of her own to add into the mix. Netting the opener in the 4-0 home win over Slovenia in September, she also got the scoring underway in Group 1’s top-two clash in Falkirk last June. With Scotland in buoyant mood as they chased their very first tournament appearance, Iceland stunned them with a 4-0 victory after Hallbera’s free-kick managed to sneak all the way into the far corner from way out on the sideline, delighting the away fans who’d travelled. That game was shown live on TV in Scotland and was a key marker for Freyr Alexandersson’s FIFA top 20-ranked side to throw down on their way to qualifying for the nation’s third major competition. Hallbera, whose father was once the mayor of her hometown Akranes in the west of Iceland, details just how much the beautiful game was knitted into her childhood, as well as where down her favoured left side of the field she enjoys operating from the most. 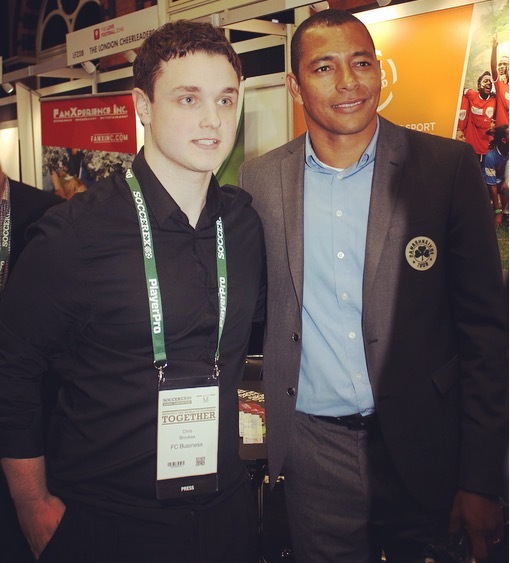 “I really like playing as a left-back, especially when I get the chance to take part in the offense. I grew up in a football family, with my brothers both playing football, and my dad used to play. Before she went on to domestic silverware with Valur, Hallbera did used to turn out for her local team, the Akranes-based ÍA. Both football and music flow through her, with plenty in the way of English-language influences to tune into when she was growing up. “The first CD I got was by my favourite band at that time called The Boys, half-Icelandic/half-Norwegian brothers who sang classic songs from some famous bands. I was around seven at that time. On the 90s-nostalgia-rich subject of the Spice Girls, it was only a few weeks ago that Hallbera’s one-time teammate Lydia Williams was on here, thinking back to a piece of her own childhood spent trying to emulate the iconic five with her friends. Speaking from the Australian team’s Algarve Cup camp in Portugal, the Houston Dash goalkeeper and recent W-League champion with Melbourne City described Hallbera as one of the funniest she has met on her adventures, with a couple of memories coming to mind that seem to sum her up reasonably well! “There was one night that she totally killed, in a good way, all the music with just a kazoo. I have footage of that somewhere. Much like her spectacular shot-stopping Aussie friend, Hallbera gets in there with the DJ duties when she’s on a team, but it was actually neither of them who did it during their time together at the mid-table Piteå. It was a homegrown defender instead who locked it down, as Hallbera recalls. The lure and prestige of UEFA Champions League play is one of the crucial reasons why certain big-name players in the women’s game opt to come to Europe. As recently as October, Hallbera came up against two of the best attacking players of modern times as her Breiðablik team took on Sweden co-captain Lotta Schelin and Brazilian star Marta in a last-32 tie with FC Rosengård. She played both legs as they were defeated 1-0 at home before playing out a goalless draw in Malmö. Among those on her side was Dagný Brynjarsdóttir’s former Florida State University teammate Berglind Björg Þorvaldsdóttir, as well as that singing talent Fanndís Friðriksdóttir. In the case of the latter, Hallbera may rate the 26-year-old attacking player as the best singer on the national team, but she also remembers the time she ‘starred’ as one half of a makeshift r&b duo, delivering a performance that maybe wouldn’t have turned heads in the music business! That show in the English capital took place in the run up to Christmas of a year that had seen the city host the Olympic Games. Hallbera herself was just a matter of months from her first showpiece spectacle, Euro 2013, which saw Iceland come up with one of the competition’s most attention-grabbing results in beating the Netherlands 1-0 in Växjö to reach the knockout phase for the first time. A youth international up to Under-21 level, Hallbera played the entirety of their four-game run to the last eight under Siggi Eyjólfsson. He was also the coach who gave her the first of her caps in a 2-0 win over Poland back in the 2008 Algarve Cup. Given the initiation she had to deliver afterwards, the game would probably seem the easy part to most people! Hallbera, however, explains how she’s never too hesitant to grab the mic. With so much talk around teammates and tracks in each interview on here, the player gets asked to combine the two, as they contemplate which song or artist they’d cover with their footballing counterparts. For some, it may seem an outrageous scenario to suggest, but with Hallbera, you could probably see it! She explains the vocal direction she would go in, as well as why the studio might be a tight squeeze. Her song choice had a grand stage when Whitney Houston performed it at the opening ceremony of the Seoul Olympics in 1988 and it is of course reaching the pinnacle of your sport or profession that we all dream of. With all going well, she will be wearing the Icelandic colours when the national anthem ‘Lofsöngur’, which rang out in France last year as such a mesmerisingly magical part of the Euro 2016 soundtrack, plays proudly for the women’s team in the Netherlands in July. They have drawn Euro debutants in Austria and Switzerland, and will kick off in Tilburg against a vastly talented France team that has yet to surpass fourth place at a major tournament. Hallbera was among the support for the men’s team at Euro 2016 and is set on doing all she can to ensure she’ll be lining up on the field in just over four months’ time. “The women’s game in Iceland is always evolving and right now I think we have a really good team; a mix of young players and the older ones with experience. Women’s football in Iceland is getting more credit from the media and more people come to watch, so I hope that it keeps evolving. 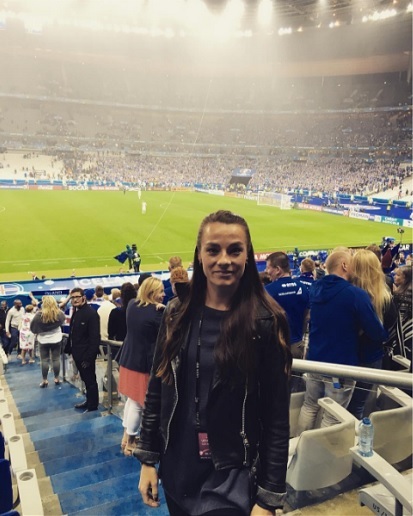 Aside from the aforementioned Dagný Brynjarsdóttir and Sara Björk Gunnarsdóttir, you can find most of the national team playing for Icelandic or Swedish clubs, with the only other exception in the latest squad being midfielder Gunnhildur Yrsa Jónsdóttir at Norwegian outfit Vålerenga. 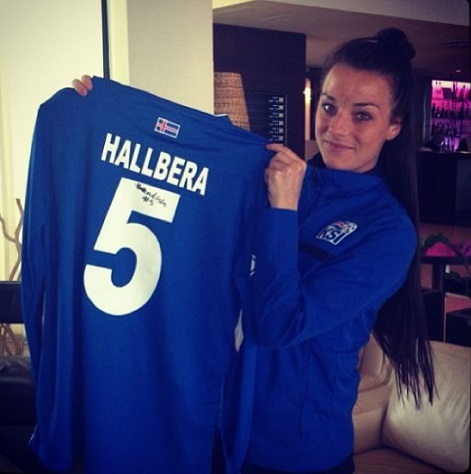 Hallbera recently linked up with a Djurgårdens team that finished 6th in the 2016 Damallsvenskan, joining teammates including goalkeeper and long-time Iceland international Guðbjörg Gunnarsdóttir. Together, they help bring considerable knowledge to what is a relatively young team, with Hallbera enthused by her return to Sweden after almost four years away. “I just signed for Djurgården, (in) Stockholm, and have been here for a month now. I’m really excited about being back in Sweden and the new team looks promising. Even with anticipation and excitement at what lies ahead, it can be good to just reflect sometimes and remind yourself of all you’ve achieved and just how far you’ve come since you first started. We can all go wading through our memories back to a period in our lives to pinpoint how experiences, for better or worse, helped move us on from the person we were. For Hallbera, she remembers that player who stepped out on the pitch in Portugal for cap number one, alongside the child she was when first starting to love the game and all it brings, as part of her football-besotted family. She knows without too much doubt what she’d have to say to those versions of herself if she had a minute with them. Having impressively taken third at the 2016 Algarve Cup, Hallbera and her teammates are currently in Portugal to try to go one, or even two better, which would naturally send ‘Stelpurnar okkar’ (‘Our Girls’) on toward the summer with their spirit bouncing. The fight for success never stops, but the meaning of the game beyond what happens on the field should never be lost, and nor should the fun for players that got them hooked back in the very beginning. For anyone in a 5-a-side game, it’s hard not to feel that enjoyment and freedom instantly surging, no matter who you’re playing with or how long since you last played. In this kind of situation, you could probably count on Hallbera to hit the target with that left foot at some point, but the question is, who would she want alongside her? This is the regular final question and the player is asked to choose four teammates from any time in their career to fill their lineup. Take it away DJ Razzberry! “As a keeper, I would pick Guðbjörg Gunnarsdóttir, who I played with in Valur, the national team, and now in Djurgården. She’s a really good keeper, as well as a great teammate. “As a defender, I would pick Pála Marie Einarsdóttir – ‘The Rock’ who always has your back. The midfielder would be Dóra María Lárusdóttir – one of the best players I’ve played with.